One of the main reasons over-eaters chronically eat too much is that they rely on food or beverages to feel better. They worry that they can’t stop their food addiction without feeling hurt or deprived. Addictive behavior disorders are basically a strategy to avoid some form of emotional pain, whether it’s a feeling of emptiness, loneliness, worthlessness, guilt, shame, abandonment, not belonging, or something of this kind. If you have resorted to this coping strategy for years (for example, eating pizza when you feel overwhelmed), it’s only normal to fear that you won’t be able to cope with life without this addictive behavior. You haven’t yet developed a new strategy to soothe that overwhelmed feeling, so all you can conceive right now is that, without food, you will be stuck with this uneasy feeling and have nothing to alleviate it. Because of this, you worry you’ll never be able to stop overeating and feel comfortable. I teach very simple techniques that can help you let go of that uneasiness in a few minutes—sometimes even just seconds. Other techniques can help you prevent building strong negative emotions to the point where you can only obsess on food for relief. I’ve read several books that give you ideas to distract your mind from your old “I’ll suppress it with food” strategy. I think they are interesting but insufficient by themselves because they don’t address the real problem. I don’t want you to struggle or just cope every day. You want to fundamentally change the way you handle emotions so that you don’t have to either obsess on food, binge eat, feel disgusted with yourself or be afraid you can’t make it on your own. To do that, you must learn to nurture yourself without food. In my article about emotional eating, I teach you the three most important skills you must develop to handle your emotions without food: listen, accept, and take care of yourself. If you apply each step diligently, you will completely change your eating patterns. Now consider what you have deprived yourself of each time you have chosen to eat food over nurturing yourself. I really want you to think this through. What are you missing each time you go for pizza, nuts, ice-cream, cookies, pretzels, etc? Let me help you. For starters, you miss the opportunity to listen to yourself and find out what you feel is really lacking in your life. You forego the chance to actually know what you’re missing and do something about it. Maybe it’s something that you missed earlier in life. Either way, there is a void in yourself somewhere, and you are trying to make the emptiness go away by stuffing that void with food. 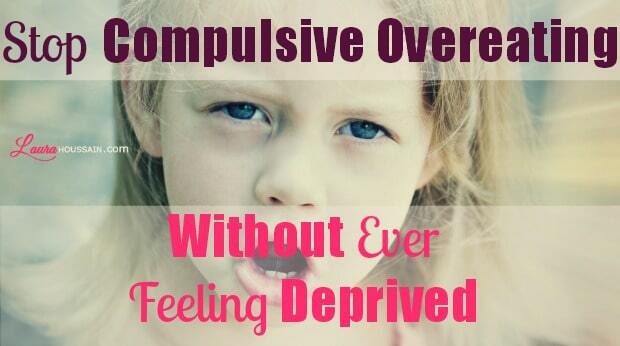 Can you sense how you have been depriving yourself with each binge? Your overeating disorder has replaced self-nurturing, loving care, and attention—and you’re craving those. Your addiction may be so strong that you are not even aware of what you feel; you’re just aware that you need to eat a lot. Even if you’re not sure whether you’re worth loving yourself or that you can love yourself, maybe you can start considering the idea. What would it feel like if I really handled the feelings I have been eluding all my life? It may seem a bit scary, but what you will find is your happy and loving self at the end of the road. You may have to grieve all the love you didn’t receive, forgive yourself and your past, and that could feel a bit uncomfortable for a few short days. However, I know techniques and I’m sharing information with you that can make the passage much easier. To end overeating, all you have to do is get out of your comfort zone and prove to yourself that you can be there for you, that you are good enough and committed to yourself—is it really that hard? It may seem so. Expect your ego or your past identity to give you a good fight. Anything new looks scary, but at the end of the road, there is freedom, a new body, good health, pride, and a powerful and beautiful woman and the road can take only a few short weeks. Think of the beautiful, confident and irresistible woman you know you want to be. I want you to hold on to that image, grab on to it as if your life depended on it, because it does; your dream life that is. I’m not talking about an average life where you keep on eating instead of getting your needs and desires met but a life where you get to show up as you, as a woman who is proud and excited to discover how great, caring, and powerful she actually is. It may feel like a stretch right now but, the truth, you are deprived right now of YOU. I want you to feel that and make that feeling stronger and stronger, and even stronger, bigger, and louder, until food almost looks disgusting, or at least not so exciting. It’s time you become honest with yourself and really take the time to look at what you’ve been doing over and over. It’s not you—it’s compulsive overeating disorder. It’s your binge-eating monster. It’s a big lie. You can do much better. Hold on to that image of YOU that you deserve to become right now, and just admit that food addiction is a strategy that is no longer serving you. When I lived in New York, I was addicted to sugar, cigarettes, baked goods, and coffee. My health became so bad that I had to get two of my teeth capped, and two more needed root canals to save them. I was 25 at the time. I had never had such problems with my teeth before. I was burned out and diagnosed with mild chronic asthma. My heart murmur, which had long disappeared, returned. I was riddled with more anxiety than I could remember experiencing before. As my anxiety got worse, so did my diet. I gained about 27 pounds and regularly used sugar, coffee, soft drinks, pastries, and ice cream as comfort foods. I left New York and looked for ways to recover from chronic stress, love addiction, and food addiction. I stumbled upon the main techniques I share with my private clients. These techniques have helped me not only get control of my addictions but also relieve stress and handle emotions in a whole new way. Do I ever regret changing? Do I feel deprived? No! When I look back at the devastating effects of what heavy coffee drinking, sugar consumption, cigarette smoking, and love addiction had on my life and how stressed and unhappy I was all the time, I feel so relieved that I was able to become the person I am today. What You CAN Gain Is the Life You’ve Always Wanted! What I suggest you do is to keep on looking at the person you’ve always wanted to be—her qualities, dreams, aspirations, body, and life to help you sense how much you have deprived yourself of that person with food addiction. Maybe you will feel deprived each time you eat too much, deprived of the person you could have been if you’d had the courage and the right tools to help yourself stop overeating and become the person you’ve always wanted to be. Maybe you will start listening to that part of you that feels deprived of your empathy and attention. And maybe binge eating won’t seem so great. Maybe you will sense that it has been stealing a part of your life, that it is measly compensation for what you have lost. I hope this article has helped you recognize some clichés about what foods can do for you and has given you some motivation to get you started with my workbook and program. Whatever you decide, please do consider what you’re depriving yourself of with food. Your life is worth much more than any junk food. First, take a piece of paper, and write about the person you want to be; then try to feel, see, hear, smell, and taste what that would be like—and make the sensations as strong and vivid as possible. Do that for two minutes twice a day for 30 days. Each time you want to grab food, think of that image and make the positive and good sensations return; and let me know how it goes. Compulsive overeating treatment can be as gentle as that. Do this diligently for thirty days and eating so much food won’t feel nearly as exciting. It happens to all my clients even the ones who like to call themselves tough cases. If you want more information like this, get free updates, sign-up for my newsletter. Just enter your first name and email in the form below and click on the subscribe button. I’m going to copy and paste this post into a Word doc and read it over and over again :). I so struggle with this. I would say I’m one of those tough cases, so I’ll let you know how the activity goes. I’ve also subscribed to your info and I’m off to buy your book :). Thanks for this post! I’m totally addicted to coffee and my 3 pm sugar rush, but I’m really trying to cut back. I understand that it’s an emotional comfort thing or how I deal with my stress. I agree that for most of us, our eating issues are emotionally-based, and that we really need to tackle the habit from an emotional/mental standpoint. Thank you Janine! I hope you’ll try the exercise in this article. I give action steps in all my articles. If you do them all, comfort eating will be gone in no time. One day, you’ll wake and just notice that that need for coffee is ancient history. The first thing I would do if I was you is try the tips in my article about emotional eating and make sure to subscribe to my newsletter ;-).